Blink and you'll miss it. 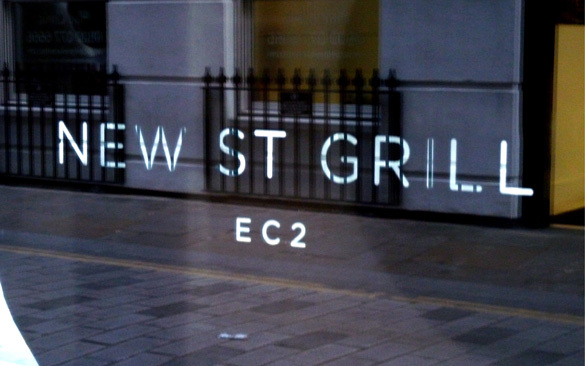 New Street Grill is tucked down an alley, a stone's throw away from Liverpool Street station, but far enough off the beaten track that you'd never know it was there. I hadn't heard of it until J invited me out for L's birthday; I found them all sitting outside in the very summery Old Bengal Bar garden. You see, the Old Bengal Warehouse - apparently London's oldest surviving spice and tobacco warehouse in the City - houses not one but three bar/restaurants and a wine shop. The guys at D&D have been busy. We moved next door into the New Street Grill and while waiting for G, ordered the first of our three bottles of red (which helpfully I now can't remember the name of, other than it was a Cote du Rhone). The restaurant's dark and seductive - lots of leather and low lighting for getting lost in - and divided up into booths and tables, all flanked by a floor to ceiling wall-length wine fridge that houses some of the 350 bottles on offer. The menu is leather bound too and brought with the wine and warm bread, making decisions hard as drinking and eating take over. With a nod to its name, there is indeed a selection of dishes from the grill - from cuts of Angus and wagyu beef to lobster - but also a 'crustacea' section offering oysters and a shellfish platter, and partridge and grouse for the gamier tastes. Alongside the a la carte, they also offer a Saturday set menu (three courses and an after dinner cocktail for £24.50) which was far too tempting to pass up. I started with the venison carpaccio - the expertly thin slices of sweet were perfectly sweet, coupled with the tangy parmesan and rocket, and a nice alternative to the standard beef. From there I was tempted by the braised daube of beef with creamed potatoes and red wine jus (which looked amazing) but went for the slightly more predictable pan fried seabass, celeriac puree and braised leeks. I just like seabass, okay?! Perfectly crispy skin, smooth puree and buttery leeks - I just wish there had been more of it. Very small sides of buttery new potatoes and baby carrots were nice accompaniments but the lobster macaroni was (unsuccessfully) calling my name. Dessert was a mixed bunch - I went for the iced brownie parfait which was a real disappointment. Sizeable chunks of brownie but the accompanying ice cream was practically tasteless and left me hankering for the Colston Basset stilton and spiced pear chutney that the others had chosen. We'd drank the place out of the Cotes du Rhone at this point so decided to settle up and head next door for our complimentary cocktail. A more industrial but still dark sliver of space, the Old Bengal Bar promised to get busy later but never really delivered. Nonetheless, the cocktail was pretty good - Mount Gay Black Barrel rum, Maraschino liquor, grapefruit juice with lime and sugar syrup. A bit of a knock out after all. New Street Grill has its pros and cons - it promises to be a 'destination' and could be a real star in an area of the city that is pretty underserved in smarter restaurants, and the service is very friendly and attentive, but the food is just a touch underwhelming and the Bengal Bar a little 'Deliverance' in style. Three and a half out of five.